Today's do-it-yourself (DIY) craft movement isn't your grandmother's knitting. Or is it? This exhibition raised provocative questions about amateur and professional art practice and the role of craft in shaping identity and creating community. A collaboration between the James Watrous Gallery, the UW-Madison's Material Culture Program, and the Wisconsin Decorative Arts Database, Handmade Meaning explored the relationship between rarely seen Victorian "fancy- work"--hand-painted china, hair wreaths, and fine embroidery-- from museums across the state, objects made by people active in the DIY movement, and work by contemporary artists who use craft processes and materials. Many of the Victorian objects, drawn from historical societies and museums throughout Wisconsin, had never been exhibited outside their home communities before this exhibition. For many women in the Victorian era, fancywork meant more than creating beautiful objects or decorating the home. It also offered important opportunities for self-expression, self-reliance, and community building. In this sense, Victorian women's pursuits were not all that different from those of people engaged in the current DIY movement, which puts a fresh spin on traditionally feminine crafts and grapples with issues of identity, community, and creativity. 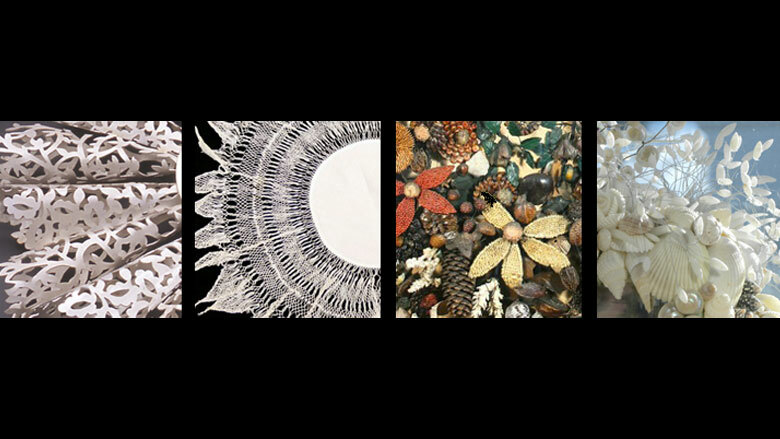 By juxtaposing fancywork with the work of contemporary artists using craft techniques, Handmade Meaning posed intriguing questions about the value of craft, the status of the amateur, and the desire to "make your own." Contemporary Wisconsin artists in the show included Anne Kingsbury, Cortney Heimerl, Hai-Chi Jihn, Marna Goldstein Brauner, and Cassandra Smith (Milwaukee); Mary Dickey (Sauk City); Susan White (Madison) and Chris Walla (Madison and Fargo, ND). The 19th and early 20th-century pieces were borrowed from historical societies and museums across Wisconsin, from the Oneida Nation Museum to the Mayville Historical Society. Visit the Handmade Meaning blog! Mixed media artist Anne Kingsbury has managed Woodland Pattern Book Center since 1979. The Center is a community-based, nonprofit literary arts center dedicated to contemporary literature and the arts. It has the largest collection of small press poetry for sale in the country.